Since we began using cloth nappies, I have not risked an entire night in one. They work beautifully for daytime, but we tend not to change the baby's nappy for up to 14 hours overnight. After trying several disposable brands and styles, we eventually found one that kept the liquid in and the baby dry. As we were doing this February Challenge it felt like the right time to take the next step and brave the cloth night nappy. I chose a Lollipop bamboo inner with a fleece liner ( to ensure his little bum stays dry all night) and a Tots Bots waterproof wrap. I was nervous dressing him for bed, and was dubious as to how well a cloth nappy would work for such an extended period of time. In the morning I was pleasantly surprised to find no leaks, and a happy dry baby! I had underestimated the cloth nappies ability. Dylan can now sleep in a beautifully soft nappy, help save the planet, and look good doing it. 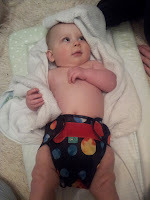 If you are planning on trying cloth nappies at night, I would recommend using a fleece liner so that their skin says dry and does not get irritated, and using a wrap in a larger size than normal, so there is more space to stuff. Bamboo is the most absorbent material for a nappy. I need to buy some specific nappies but waiting till baby is here, I've heard totsbots bamboozles are good!